If you’re like most people, you probably drink alcohol regularly. According to statistics, there were 136.8 million drinkers in the US in 2013. But have you wondered what alcohol is doing to your body and brain? Sure, if you can stick to one drink a day, the effects aren’t that huge. But many people find it hard to stop once they’ve had a couple drinks and the cumulative effects can add up. As soon as you consume alcohol, around 33% of it gets absorbed into the blood through the stomach lining. The remaining alcohol is absorbed more slowly into the blood through the small intestine. Once it’s in the bloodstream, alcohol spreads into almost every biological tissue in the body, as cell membranes are highly permeable. The recommended maximum intake of alcohol is 2 drinks per day for men and 1 drink per day for women. Consuming more than this can be problematic. Five or more drinks per day for men (4 for women) is considered binge drinking. The effects of alcohol on the brain are quite complex. Just about any substance that we get pleasure from tends to affect the brain processes that are involved in reward and control. And over time with addiction, the brain gets used to having alcohol and the dopamine receptors become less sensitive. Stopping results in problems because your brain isn’t ready for it. That’s what happens with withdrawal. But it’s not just the reward system in the brain that alcohol affects. Alcohol affects many other areas of the brain, such as memory and motor coordination. According to Dr. Samuel Ball, when someone becomes alcohol dependent, it can be one of the most destructive drugs to various parts of the body and different organ systems. From the top-down, alcohol can have significant affects on cognitive impairment, memory loss, lack of motor coordination. It can also cause esophageal problems, down to the stomach and pancreatitis, and also liver disease because the liver helps get rid toxic things throughout the body. When that starts shutting down, it’s unable to process alcohol and get rid of its by-products, which can lead to other organs from losing functioning. Worst case scenarios can be things like alcohol related dementia or delirium, which are serious problems that can lead to people going into nursing homes. In a somewhat surprising decision, UNESCO ruled last week that the Great Barrier Reef – one of the Earth’s great natural wonders – should not be listed as “World Heritage in Danger”. The World Heritage Committee praised the Reef 2050 Long-Term Sustainability Plan, and the federal minister for the environment, Josh Frydenberg, has called the outcome “a big win for Australia and a big win for the Turnbull government”. But that doesn’t mean the Reef is out of danger. Afforded World Heritage recognition in 1981, the Reef has been on the warning list for nearly three years. It’s not entirely evident why UNESCO decided not to list the Reef as “in danger” at this year’s meeting, given the many ongoing threats to its health. However, the World Heritage Committee has made it clear they remain concerned about the future of this remarkable world heritage site. UNESCO’s draft decision (the adopted version is not yet releasesd) cites significant and ongoing threats to the Reef, and emphasises that much more work is needed to get the health of the Reef back on track. Australia must provide a progress report on the Reef in two years’ time – and they want to see our efforts to protect the reef accelerate. Right now, unprecedented coral bleaching in consecutive years has damaged two-thirds of Australia’s Great Barrier Reef. This bleaching, or loss of algae, affects a 1,500km stretch of the reef. The latest damage is concentrated in the middle section, whereas last year’s bleaching hit mainly the north. Pollution, overfishing and sedimentation are exacerbating the damage. Land clearing in Queensland has accelerated rapidly in the past few years, with about 1 million hectares of native vegetation being cleared in the past five years. That’s an area the size of the Brisbane Cricket Ground being cleared every three minutes. About 40% of this vegetation clearing is in catchments that drain to the Great Barrier Reef. 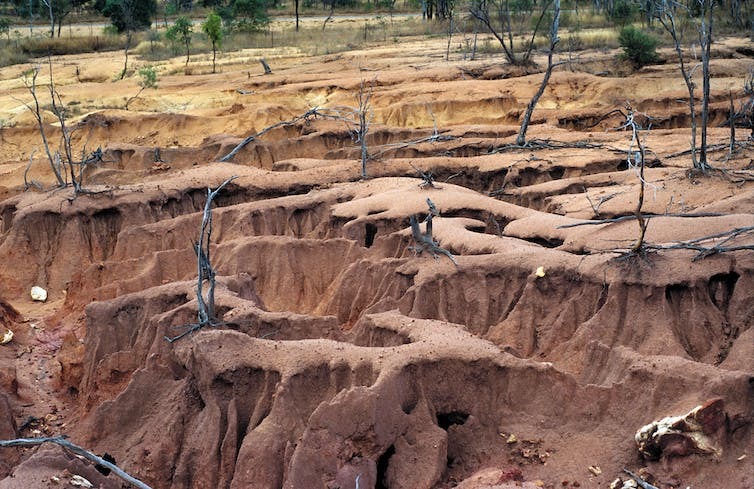 Land clearing contributes to gully and streambank erosion. This erosion means that soil (and whatever chemical residues are in it) washes into waterways and flows into reef lagoon, reducing water quality and affecting the health of corals and seagrass. Landclearing also directly contributes to climate change, which is the single biggest threat to the Reef. The recent surge in land clearing in Queensland alone poses a threat to Australia’s ability to meet its 2030 emissions reduction target. Yet attempts by the Queensland Government to control excessive land clearing have failed – a concern highlighted by UNESCO in the draft decision. Land clearing can lead to serious hillslope gully and sheet erosion, which causes sedimentation and reduced water quality in the Great Barrier Reef lagoon. The Reef remains on UNESCO’s watch list. Just last month the World Heritage Committee released a report concluding that progress towards achieving water quality targets had been slow, and that it does not expect the immediate water quality targets to be met. The draft decision still expressed UNESCO’s “serious concern” and “strongly encouraged” Australia to “accelerate efforts to ensure meeting the intermediate and long-term targets of the plan, which are essential to the overall resilience of the property, in particular regarding water quality”. This means reducing run-off of sediment, nutrients and pollutants from our towns and farmlands. Improving water quality can help recovery of corals, even if it doesn’t prevent mortality during extreme heatwaves. The Great Barrier Reef is the most biodiverse of all the World Heritage sites, and of “enormous scientific and intrinsic importance” according to the United Nations. A recent report by Deloitte put its value at A$56bn. It contributes an estimated A$6.4bn annually to Australia’s economy and supports 64,000 jobs. Excessive landclearing in Queensland, which looks like being a core issue in the next state election, has been successfully curbed in the past, and it could be again. But the reef cannot exist in the long term without international efforts to curb global warming. To address climate change and reduce emissions, we need to act both nationally and globally. Local action on water quality (the focus of the Reef 2050 Plan) does not prevent bleaching, or “buy time” to delay action on emissions. We need adequate funding for achieving the Reef 2050 Plan targets for improved water quality, and a plan to reach zero net carbon emissions. Without that action, an “in danger” listing seems inevitable in 2020. But regardless of lists and labels, the evidence is clear. The Great Barrier Reef is dying before our eyes. Unless we do more, and fast, we risk losing it forever. By James Watson, Associate Professor, The University of Queensland and Martine Maron, ARC Future Fellow and Associate Professor of Environmental Management, The University of Queensland This article was originally published on The Conversation. Read the original article. Researchers at the University of Southern California have announced that fasting for as little as three days, can regenerate the entire human immune system for a very healthy living. The researchers described their study as “remarkable and a major breakthrough” in finding natural methods to boost the immune system. In the past, fasting diets have been criticized by nutritionists for being unhealthy. However, this new study by suggests that starving the body kick-starts stem cells into producing new white blood cells, which fight off infection. The researchers said their discovery could be particularly beneficial for people suffering from damaged immune systems, such as cancer patients on chemotherapy. Elderly people, too, are said to benefit greatly from the study. As people grow, their immune system becomes weak, making it harder for them to fight off even common diseases. As per this study, fasting could help them get their immune system back on track. Fasting for 72 hours also protects cancer patients against the toxic impact of chemotherapy. Chemotherapy saves lives, but it also causes significant collateral damage to the immune system. The results of this study suggest that fasting may mitigate some of the harmful effects of chemotherapy. Detailing the study, the researchers said fasting “flips a regenerative switch” that prompts stem cells to create brand new white blood cells, essentially regenerating the entire immune system. Lead researcher of the study Professor Valter Longo, who serves as professor of Gerontology and the Biological Sciences at the University of California, said the study proved that fasting could indeed help the human body to produce a new immune system. It gives the ‘OK’ for stem cells to go ahead and begin proliferating and rebuild the entire system. And the good news is that the body got rid of the parts of the system that might be damaged or old, the inefficient parts, during the fasting. Now, if you start with a system heavily damaged by chemotherapy or ageing, fasting cycles can generate, literally, a new immune system.” Professor Longo said. At the Experimentation stage of the study, some people were asked by the researchers to regularly fast for between two and four days over a period of six months. The researchers then found that the fasting helped to produce a new immune system, as well as reducing the enzyme PKA, a hormone which increases cancer risk and tumor growth that is linked to ageing. The study said prolonged fasting not only forces the body to use stores of glucose and fat, but it also breaks down a significant portion of white blood cells. During each cycle of fasting, this depletion of white blood cells induces changes that trigger stem cell-based regeneration of new immune system cells. “We could not predict that prolonged fasting would have such a remarkable effect in promoting stem cell-based regeneration of the hematopoietic system. When you starve, the system tries to save energy and one of the things it can do to save energy is to recycle a lot of the immune cells that are not needed, especially those that may be damaged,”Professor Longo added. With the study having been experimented already, more clinical trials will be able to determine other factors. If that is done, one can see a physician for an appropriate fasting recommendation. This article (Study: Fasting For Only Three Days Can Regenerate The Entire Immune System Of Humans) is free and open source. You have permission to republish this article under a Creative Commons license with attribution to the author and AnonHQ.com. Can you imagine the profound shift in how we understand the human condition if someone actually figures out how to reverse the aging process? One researcher at Harvard believes he has struck upon the answer and claims to have found a way to halt the aging process in mice. This is incredibly exciting and yet concerning at the same time. The short version of telling the story of the research is that we allegedly have a protein in our systems which when we’re young repairs any damage to our DNA. But as we get older, a new kind of protein blocks this original one, resulting in damage to our DNA which gives us the characteristics of being old. Dr. Sinclair believes he’s found a molecule which goes between these proteins, resulting in the DNA repair process working again. At present, he’s only seen this process working in mice and much work needs to be undertaken to be able to apply these findings to humans. Of course, if this was to happen, would you ever want to be immortal? Do you want to live for hundreds or even thousands of years? What if you could reverse the effects of aging, but we still had diseases like Alzheimer’s Disease? We may be able to prolong our life but not our quality of life. Even if we could address these concerns, the question remains whether you want to go on living or whether you’ll lose your zest for life over time. Finally, the reality is that if this treatment is available it will first be used by the rich. Will we see a situation where the rich improve the quality of their genes before others, resulting in a a society not only unequal in opportunity but also in genetics? There is a lot to consider in the development of medicine that can reverse the course of aging. What do you think of extending our lifespans to live forever? Let us know in the comments. A plant native to the Amazonian jungles has been used by the indigenous population for generations untold for physical, spiritual and emotional health. Now, science is beginning to prove its efficacy. If you’re interested in alternative medicine and deep spiritual work, you’ve probably caught wind of a hard to pronounce, and very powerful purification rite called Ayahuasca. This ancient A word is Quechua in origin and refers both to an Amazonian healing ceremony and also the sacred beverage that is drank during it. Ayahuasca has made headlines in recent months for its psychedelic properties which induce visions, as well as its purgative properties which cause many to expel liquids and solids from their bodies – a ritual detoxification of sorts. This ancient jungle brew is used by tribes in the Amazon Rainforest to heal the body, mind, and spirit. A medicine man or woman will “prescribe” a ceremony to aid in treating a variety of ailments, from psychological / emotional to the purely physical. Many Westerners have begun to seek it out in hope of ridding themselves of limiting beliefs, letting go of the past, and moving on from negative imprints left from troubled periods of their lives. Others are desperately seeking an alternative treatment for chronic illnesses like MS, diabetes, Parkinson’s and cancer. Recently, a number of personal healing stories are beginning to surface that, if true, are very promising indicators of Ayahuasca’s curative potential. But how does this jungle brew work? It’s one thing to experience the benefits, but it’s another to figure out what actually transpired to heal us, or at least got us going in the right direction again. Here’s an inside look at how Ayahuasca affects the human organism. First of all, Ayahuasca is made from two main jungle plants: the actual Ayahuasca vine, orBanisteriopsis caapi, and the leaves of another plant, usually called Chacruna, or Psychotria viridis. The Chacruna contains a substance called Dimethyltryptamine (DMT), which is the chemical that induces hallucinations. We naturally have small amounts of this in our bodies, and it exists in most green leafy vegetables. When taken by itself, nothing really happens, because the Monoamino Oxidase (MAO) enzymes that live in our gut naturally break down the DMT before it ever gets into our blood stream. However, the Ayahuasca plant contains beta-carboline alkaloids including harmine, harmaline, and tetrahydroharmine that block the MAO enzymes from doing their job, and essentially keep the DMT active. This allows it to cross the blood-brain barrier after it’s ingested, and once that happens, the countdown to an altered state of reality has begun. Once the DMT reaches the receptors in your brain, the neurons begin to fire. When the effects of Ayahuasca start to take hold, multiple areas of the brain are triggered. It activates the amygdala, which holds early emotional memories, usually traumatic ones. It also activates the neo-cortex, associated with our perception and ability to reason and make decisions. For those who have experienced this sacred potion that many called “Grandma”, it probably comes as no surprise that it also activates the insular cortex, which plays a major role in awareness and consciousness. Unlike psychedelic experiences with other substances, in which a person may not know what’s happening while they are under the influence, participants in an Ayahuasca ceremony are generally very alert and aware of what they are experiencing. The combination of this heightened awareness and fingertip access to emotional and sometimes long-forgotten memories allows an individual to begin “the deep work”. Everything can be processed through a new lens, often times without any re-traumatization, and with an expanded capacity for mindfulness and empathy. We also know that Ayahuasca has a calming or quieting effect on a group of interacting regions of the brain known as the Default Mode Network (DMN). When this complex system is too active, symptoms include anxiety or depression. Meditation has been show to work with the DMN in the same way to counteract those symptoms, and as we know, there’s plenty of scientific research and study on the benefits of meditation. Another important aspect of Ayahuasca is how it works to manage stress at the cellular level, specifically with the Sigma-1R receptor – a protein that binds to DMT. Found in the brain and organs including the heart, lungs and liver, as well as the immune system in general, it helps other proteins to align into their proper shapes. Many diseases are associated with proteins like this that don’t work properly, and malfunctioning Sigma-1R is linked to depression, Alzheimer’s, addiction, cancer, Parkinson’s and traumatic brain injuries. This study on the possible effects of Ayahuasca against various diseases, suggests that as DMT binds to Sigma-1R, what transpires is an effect that protects the cells by restoring neurons and regulating immunity. If Ayahuasca truly does regulate the causes of cellular stress, it is a promising and suitable candidate for interfering with the conversion of environmental and psychological stress into cellular stress. Now that you’ve got an idea of the “how,” it’s important to remember that the indigenous cultures who created this brew believe that there is far more at play here than mere chemistry. A shaman will tell you that for the experience to produce the strongest result, it must be done with the right surroundings (usually in nature) and under the supervision and care of the right “administrator” (usually referred to as an Ayahuascero or Curandero). Other things to take into account are the dosage, admixtures with other plants or ingredients, and even the condition or past history of the person taking it. An interesting observation cited in the study mentioned above is that the South American tribes hit the nail on the head when it comes to finding a broad-spectrum remedy. But the ingenuity and intimate knowledge of herbalism that these cultures possess is just the tip of the iceberg. There’s one major detail about the two primary ingredients in Aya that has anthropologists and botanists baffled. They grow hundreds of miles away from one another, in completely different microclimates tucked into a green sea of over 60,000 plant species. The improbability of these native tribes knowing which two plants to boil together in a pot for hours and hours and exactly how to administer the thick liquid that results is almost too much to ponder. Was it intuition? Curiosity? Trial and error? Were they actually communicating with the plants, which some say have their own consciousness, or were they guided by some ancestral force? This is all part of the mystery that this sacred drink holds. It’s a mystery that many say can only be understood via one course of action. Taking a sip. GreenMedInfo.com provides cutting-edge, evidence-based natural health information and has one of the internet’s most popular e-newsletters with over 100K subscribers. Register for free here. While spiders terrify me, I still find interest in observing a web or two. The intricate lines of arachnid artwork prove to be one of the nature’s most striking creations, and seeing as I am an artist, I appreciate such beauty. Ever wonder how a spider web works? Well, I used to be intrigued by this myself. A spider’s web is remarkable. It serves as the primary way in which the spider survives. Without the web, the spider would have no tool to lure, catch and devour its prey. What’s more, the process of building a web takes a little time at all. It only takes between 20 and 30 minutes for the arachnid to build its web. First, the radii must be placed at set intervals. The spider, then, crosses the radii in pendulums and round turns to set the insect-catching zones. After the work is completed, the spider settles at the hub of the web and stretches out its legs. It can now feel each vibration that occurs on the web, thus catching prey trapped its natural structure. But what happens when, like us human creatures, spiders become subject to hallucinogenics or other mind-altering substances? H.M. Peters, zoologist, began filming the web-building techniques of the Orb spider in 1948. This project was part of his research conducted at the University of Tubingen in Germany. The original plan was to simply film the ritual of the Orb spider, which occurred predominantly between 2 and 5 in the morning. The work soon became dreadfully boring, and so Peters got creative. His intention was to alter the internal clock of the spider in order to work during the hours of the day of his choice. Peters enlisted the help of pharmacologist Peter Witt. Peters and Witt, together, formed a plan. In order to change the spider’s time of web-building, they would need to change the functioning of the spider. The duo decided to lace water with a variety of mind-altering drugs such as LSD, amphetamines and marijuana, along with many other substances. The lighting and temperature of the laboratory were regulated for controlled results. The webs could not serve what the spiders had intended them to. The creations were ugly and proved to be useless for catching the spider’s prey. The webs included irregularly spaced radii but with the same basic geometry. With high dosages of LSD, web-building was completely altered. Dosages that were just a bit lighter made the webs appear psychedelic. Sometimes the spiders couldn’t do anything under the LSD influence. Low dosages of LSD almost created a normal web, but still with compulsive lines and sections. Soon, after observing the results of drug-induced web-building, Peters abandoned the research. Witt continued in his tests, experimenting with other substances and combinations. He also questioned the comparison between the spider’s mind and our own while using these substances. Results are unclear as to whether the tests proved useful in any way. Although scientific interest with spider experimentation decreased, Witt continued testing mind-altering effects on the orb spider until his death in 1998.